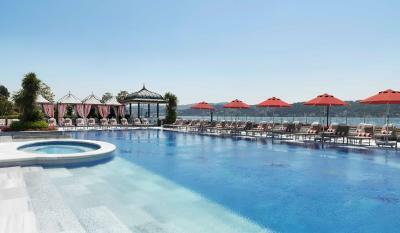 Lock in a great price for Four Seasons Hotel Istanbul at the Bosphorus – rated 9.1 by recent guests! I liked the staff the view the location of the Hotel . 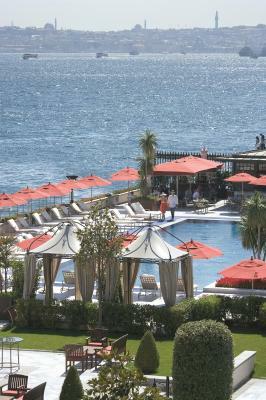 Location,the food , the cleanness and the view of Bosporus from the hotel is amazing!!! Every thing. 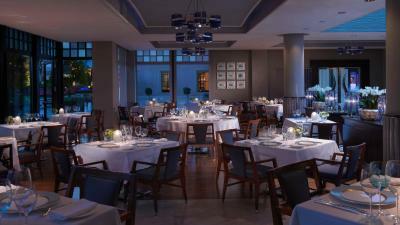 The staff replaced sliver spoons, knives and forks with stainless steel one. Thanks for their prompt response. 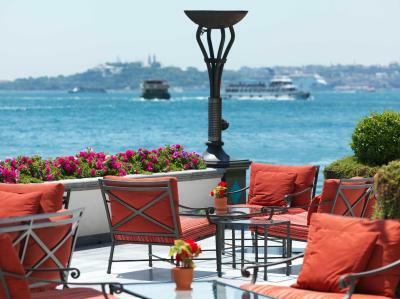 Four Seasons Hotel Istanbul at the Bosphorus This rating is a reflection of how the property compares to the industry standard when it comes to price, facilities and services available. It's based on a self-evaluation by the property. Use this rating to help choose your stay! 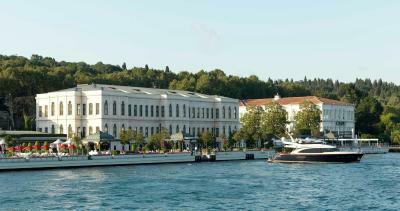 Located along the Bosphorus, this renovated 19th century Ottoman palace features a historic architecture in harmony with luxurious details. 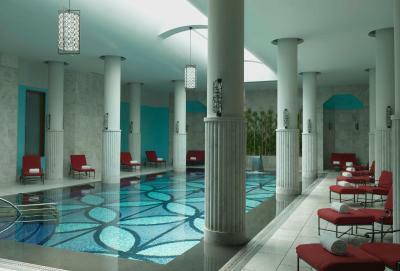 An indoor pool and a heated outdoor pool with free parasols and sun loungers are available. 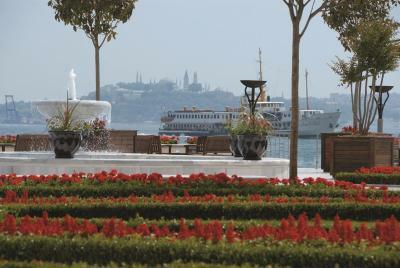 The seafront property also has a garden and a spacious terrace with panoramic views of the Bosphorus. Free WiFi and private parking are available on site. Tastefully decorated with fine furnishings, each air-conditioned room offers an iPod docking station and a flat-screen TV with satellite channels. A mini-bar, safety deposit box and a desk are also provided. 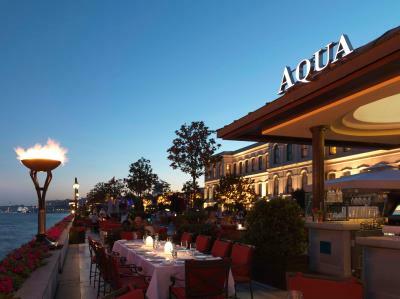 Aqua Restaurant, with its terrace overlooking the Bosphorus, serves Mediterranean cuisine, with Italian and Turkish specialties. 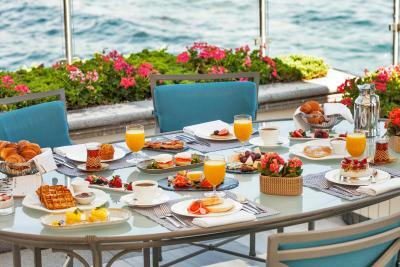 Guests can enjoy the breakfast with international flavors in buffet style. Pool grill is an ideal choice for fresh salads, crispy grilled kebabs and tender fresh fish. 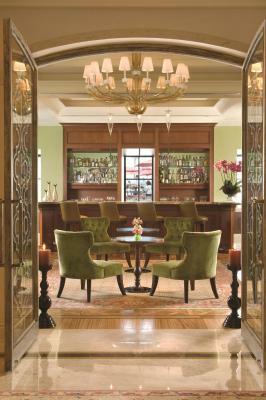 The Lobby Bar and Lounge is a cozy place for socialization. 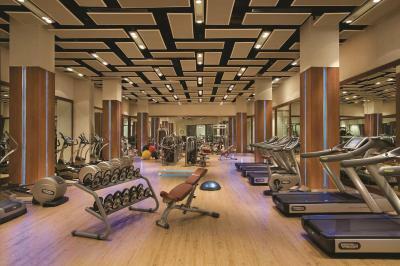 You can work out in the fitness center and then relax in the sauna. 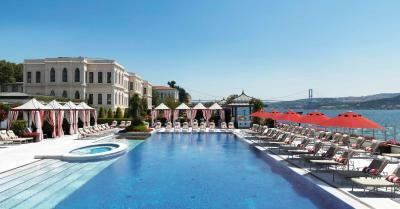 Guests of this luxurious hotel can also benefit from the exotic atmosphere of the Turkish bath afterwards. 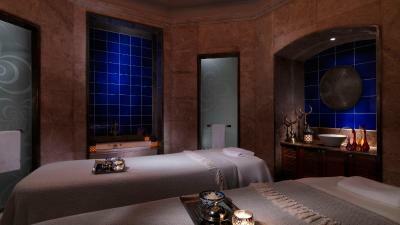 Spa therapy and body treatments are also possible. The reception is at your service 7/24, and provides room service. 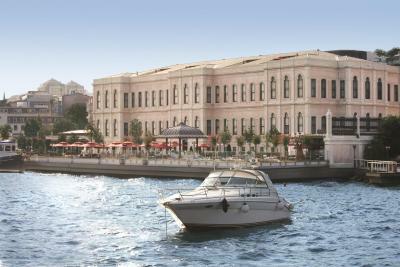 Four Seasons Hotel Istanbul at the Bosphorus is only a 4-minute walk from one of Istanbul’s lively scenes, Besiktas Square. Ataturk Airport is 16 mi from the property while Istanbul Airport is 31 mi away. 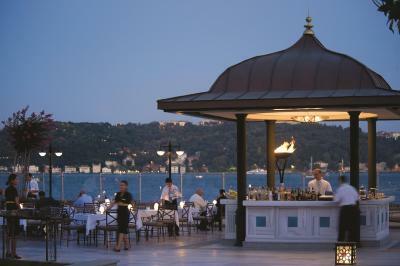 When would you like to stay at Four Seasons Hotel Istanbul at the Bosphorus? Blending contemporary and Ottoman Turkish design, this spacious room offers views of the exterior garden, street or the historic school building next door. 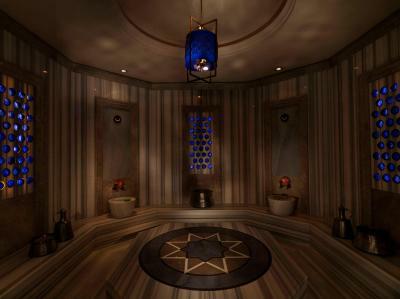 It has relaxing color scheme of deep blue or terra cotta with copper and burgundy accents. Decorated with rich, custom-designed fabrics and mahogany furniture, this room also has a spacious bathroom with thick terry bathrobes, heated floors and deep soaking tub. 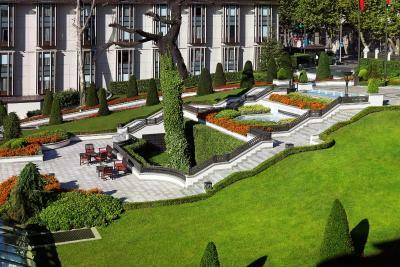 It also provides 24-hour in-room dining and multilingual concierge, fully stocked private bar, dual-line telephones with voicemail, cable and satellite TV and wired and wireless high-speed Internet access. Blending contemporary and Ottoman Turkish design, this spacious room features a relaxing color scheme of deep blue or terra cotta with copper and burgundy accents. Decorated with rich, custom-designed fabrics and mahogany furniture, this room also has large windows with views of the hotel's grand entrance and the courtyard. It also provides a 42-inch" flat-screen high-definition TV, stereo system with CD and DVD players, in-room movies and cable TV, and fully stocked private bar. The lavish marble bathroom provides thick terrycloth bathrobes, heated floors and a deep soaking tub. 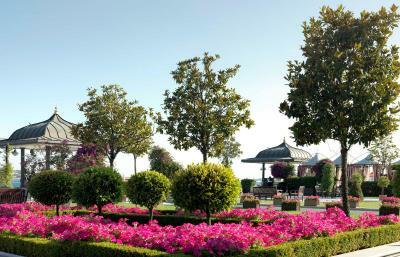 Wired and wireless high-speed Internet access are also provided. Blending contemporary and Ottoman Turkish design, this spacious room features rich, custom-designed fabrics and mahogany furniture. This room also has large windows with limited and angled views of the Bosporus. 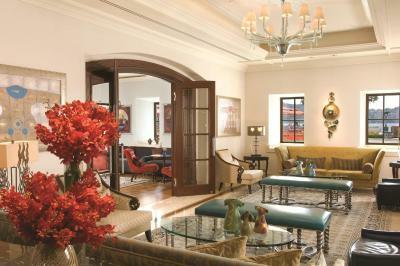 It also provides a fully stocked private bar, cable TV, an in-room safe and dual-line telephones with voicemail. The lavish marble bathroom has Turkish details, a large wood vanity, a deep soaking tub and separate glass-enclosed shower, and toilet with telephone in a separate alcove. Blending contemporary and Ottoman Turkish design, this spacious room features a relaxing color scheme of deep blue or terra cotta with copper and burgundy accents. Decorated with rich, custom-designed fabrics and mahogany furniture, this room also has large windows with views of the hotel's grand entrance. 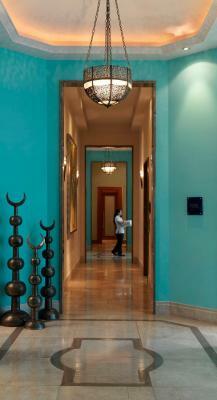 With high ceilings, hand-painted with traditional motifs, the room provides a palatial feel. 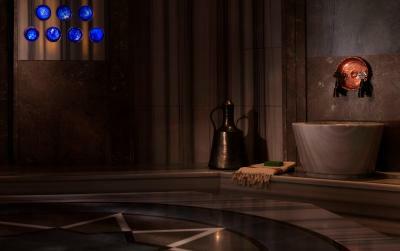 The lavish marble bathroom provides thick terrycloth bathrobes, glass-enclosed shower and deep soaking tub. Blending contemporary and Ottoman Turkish design, this spacious room features a relaxing color scheme of deep blue or terra cotta with copper and burgundy accents. Decorated with rich, custom-designed fabrics and mahogany furniture, this room also has large windows with views of the Strait of Bosporus, the Asian shores, the Maiden Tower and the domes and minarets of Old Town. With hand-painted high ceilings and hardwood accents throughout, this unit provides an Ottoman mansion feel. Guests of this room can enjoy the entertainment center with flat-screen TV, stereo system and CD and DVD players. Blending contemporary and Ottoman Turkish design, this spacious suite features a relaxing color scheme of deep blue or terra cotta with copper and burgundy accents. Decorated with rich, custom-designed fabrics and mahogany furniture, this suite also has a spacious living area with an Ottoman-style sofa. It also has 42" flat-screen TV, writing desk, dual-line telephones with voicemail and high-speed Internet access and a stereo system with CD and DVD players. The lavish marble bathroom has Turkish details, a large wood vanity, deep soaking tub and separate glass-enclosed shower and a toilet with telephone in a separate alcove. On the top floor of the historic palace building, this suite blends contemporary and Ottoman Turkish design, and features a relaxing color scheme in tones of deep blue or terra cotta, with copper and burgundy accents. 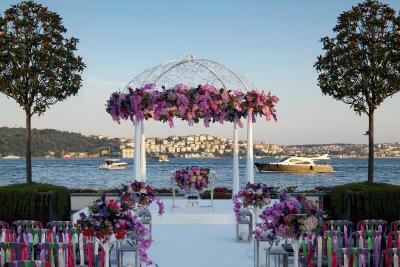 Decorated with rich, custom-designed fabrics and mahogany furniture, it also features a spacious 270-ft² private terrace with breathtaking views of the Strait of Bosporus, Maiden Tower, the Old Town skyline and the shores of Asia. The spacious living area has an entertainment center, and the marble bathroom has a deep soaking tub and glass-enclosed shower. Blending contemporary and Ottoman Turkish design, this spacious suite features a relaxing color scheme of deep blue or terra cotta with copper and burgundy accents. Decorated with rich, custom-designed fabrics and mahogany furniture, this suite also has French doors separating the living and sleeping areas. Living room overlooks the adjacent historic school or beautifully landscaped grounds, and the bedroom looks out on the Strait of Bosporus. The lavish bathroom provides thick terrycloth bathrobes. Evening turndown service is also available. Blending contemporary and Ottoman Turkish design, this spacious suite features high ceilings and large double-glazed windows with panoramic 180-degree views of the Bosporus. Along with high ceilings, it also features a 42" flat-screen TV, a stereo system with CD and DVD players, and a fully stocked private wet bar in living area. The lavish marble bathroom has a deep soaking tub and plush terrycloth bathrobes. Please note that there are 2 types of this luxurious suite. 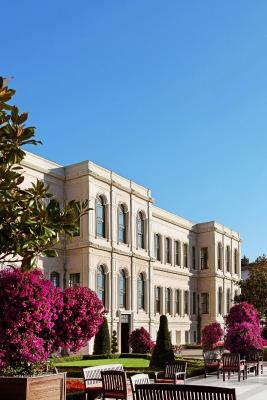 One of them has high ceilings and a loft-style bedroom separated by six steps from a spacious living room. 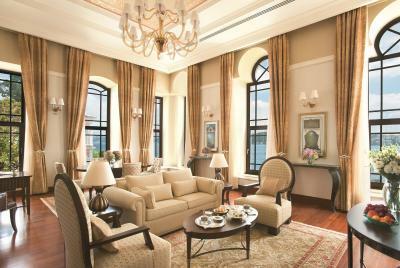 The other suite, on the second floor, features bay windows with breathtaking views. The marble bathroom in both suites has heated floors. Decorated in shades of beige and terra cotta, with copper and burgundy accents, this suite is a unique interpretation of Ottoman Turkish design. 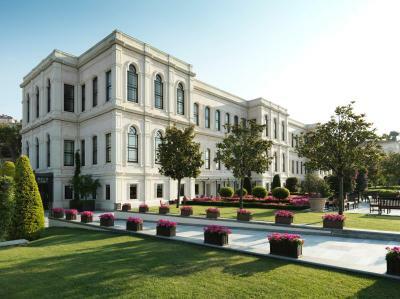 Decorated with contemporary mahogany furniture and custom-designed fabrics, it also has high ceilings with hand-painted traditional motifs, and Turkish and Ottoman lithographs and art. 42" flat-screen TV, a fully stocked private bar, a stereo system with CD and DVD players, and in-room movies, cable TV and high-speed Internet access are also provided. 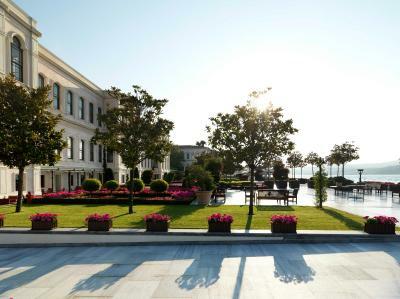 Guests of this unit can enjoy the Bosporus view from the Suite living room and view of the inner courtyard and the Hotel's grand driveway from the second bedroom. 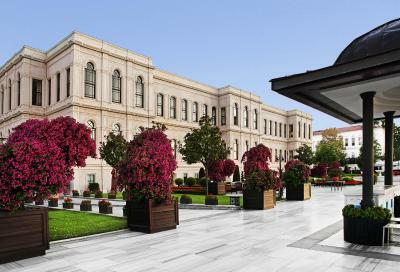 An Ottoman palace with contemporary glamour and energy East meets West and history meets whatever is coming next at Four Seasons Hotel Istanbul at the Bosphorus. In this modern, resort-like hotel crafted from a private, 19th-century pasha's getaway, gaze under huge skies from the indigo water's edge to the misty hills of Asia. 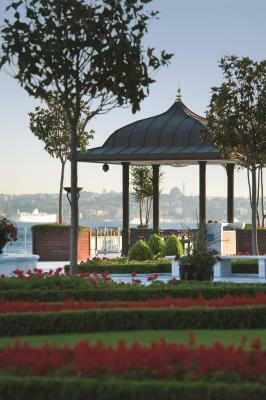 Sun-washed and airy, Four Seasons envelops you in glamour and luxurious sophistication in this one-of-a-kind location, surrounded by the best of inspiring Istanbul, creating a fitting base from which to explore the upscale shops, restaurants and bars of the city’s modern center. 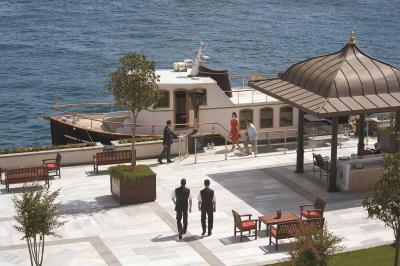 Four Seasons Hotel Istanbul at the Bosphorus offers a stylish escape for those looking for the most enjoyable way to beat the traffic to and from the airport; A luxury boat transfer, combined with a short drive from Ataköy Marina. 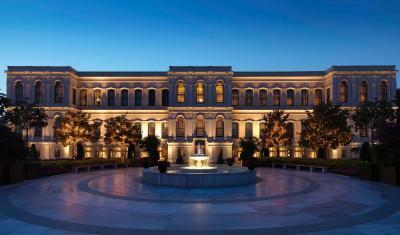 House Rules Four Seasons Hotel Istanbul at the Bosphorus takes special requests – add in the next step! 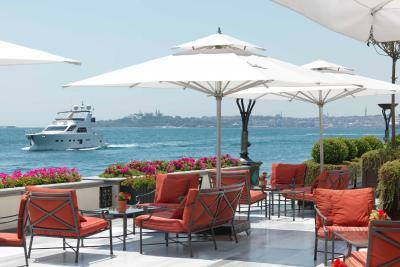 Four Seasons Hotel Istanbul at the Bosphorus accepts these cards and reserves the right to temporarily hold an amount prior to arrival. Please note that only dogs that are 7 kg or less are allowed at the hotel. Please kindly be informed that smoking is allowed only in certain rooms. Smoking in nonsmoking rooms are subject to an extra charge to cover deep-cleaning expenses. Breakfast was pretty much like all FS breakfasts with the addition of a few Turkish dishes which made it interesting from the usual fare. 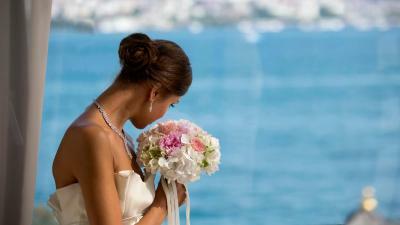 The staff was very professional and hospitable. I got an upgrade upon check in and the room was very nice. The small gestures made by the hotel for children is very nice. The check in and check out were very fast and pleasant. I will definitely repeat it.